Mini muffins are the perfect little treat to add a bit of sweet flavor to breakfast or tea time. These mini bites of muffin goodness get their softness from the moisture in the zucchini, a slight sweetness from the blueberries, and are healthed up with the wheat flour. 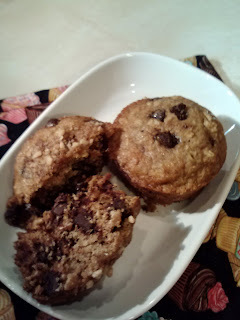 I also like the depth of flavor from using both white and brown sugar so the muffins are sweet but not sugary. Plus the cinnamon is a nice kick of flavor. If you took my suggestion of preshredding and freezing some leftover zucchini at the end of last summer's harvest, you'll be glad you did when you whip up these mini muffins. I popped a couple of these into my work bag for breakfast and also shared them with my January Foodie Pen Pal as a yummy but healthy treat to help us both stay on track with our New Year's resolution of not eating too terribly. I love breakfast potatoes, specifically hash browns, but they take forever to cook up crispy and crunchy, even if you get the ones frozen from the grocery store. So I loved this idea of mini potato "muffins" with cheese, baked up crisp, frozen until ready and popped in the microwave for a quick and delicious breakfast add on. I've been taking these to work in the morning to pair with my yogurt and fruit. Dave's been adding them to his eggs in the morning for a little more substance and a lot more yum. These would also be perfect on a brunch buffet and could be made without the cheese, or with some extras like peppers and onions. This is quickly becoming on of our favorite chilis (I have quite the arsenal of chili recipes, so that's saying something). It's also a great recipe to use up leftovers in a completely different way. We'll have rotisserie chicken from time to time, and since there's only two of us, there is often a lot leftover so this recipe re-purposes the extra into a delicious, hearty and satisfying chili perfect for these frigid temperatures we've had hear in the northeast this last week or so. There's a lot of good flavor in this and despite the can of green chiles and whole jalapeno, the heat is mild (but you can amp it up if you want a little more. The cilantro and corn provide a fresh flavor that pairs well with the pinto beans and chicken. You know those boxes in the freezer section that claim to contain perogies? Shh, don't say that word! Growing up, it was a curse word to refer to the frozen version as actual perogies. Not that there is anything wrong with them per say, but clearly you just need to know how to make an authentic, homemade version to know why the frozen version just won't cut it. When we would enjoy these as a family, if it wasn't my Mom making them, the only justifiable alternative was to buy them from the church ladies because at least those were homemade, too. Served coated with melted butter and onions that cooked down and caramelized, perogies are part side dish, part meal on their own and pure delicious. A perfect, tender pasta dough stuffed with potato and other goodies, it's hard to resist carbs filled with more carbs and smothered in butter. Delicious, comforting, and tastes like home. Hungry? Hungry for chocolate? Maybe some peanuts and caramel? Well grab a huge glass of milk and let's get to town. Dave looked at these and said they looked intense. I responded, "Eh, we've got milk," because these cupcakes are rich, delicious and might just be my favorite new cupcake. The rich, chocolate cupcake is stuffed with chunks of Snickers candy bars and caramel, topped with a creamy caramel buttercream and more chunks of Snickers. Heaven. You need these. They might just change your life. Or just put you in a nice sugar coma for an afternoon. Either would be good. Granola bars are always around our house. They are an easy snack to throw in a bag when we're off to work or playing outside. They sometimes get a bad rap for not being the healthiest option, but I like them because they can be filling with some whole grains and a little sweetness. And when you make them yourself, you can control how you add that sweetness. And these bars are made with honey, coconut oil and get an added flavor component from the flaked coconut. And you know I'm not a huge coconut fan, but the way it toasted up in these bars provides a nice change of pace. And of course, the chocolate chips play a nice supporting role in this snack. This is comfort food. Warm, cozy, hearty and lots of flavor. All the veggies cook up so tender in the juices and there is so much flavor in that chicken. Served over rice with lots of juice, the meat is so tender we didn't even use knives. This was pretty quick to prepare for the crock pot, too. Just some veggie prep, add the meat, seasoning and soup and your are good to go. But I didn't just use a can of cream soup. I found a dry mix that you can prepare in batches and then mix up as needed, removing all the preservatives and other question marks you might have about what really is in that can of soup. So many crock pot meals require cream soups and I will consciously decide not to make them because sometimes I don't want processed food (it leaves me more room for the chocolate and butter-laden goodies I make here). So consider this post a two-for-one: you'll get this lovely chicken and veggie dinner that is super simple as well as an easy homemade mix that you can substitute for cream of chicken soup in your favorite recipes. Homemade takeout and made in the slow cooker? Yes and please. My parents never liked Chinese food, so growing up, I never had it. The first time I tried it was when a friend took me out for my birthday in high school and suggested I try it. I ordered the beef with broccoli and it quickly became my favorite. Now, instead of ordering it every time I go, I can have it at home whenever I want! I love how the broccoli cooks in this sauce, but still has a bit of a crunch, even after sitting in the crock pot for a while. The sauce is perfect and the addition of sesame oil really gives it that authentic flavor. Uh, yes. I did. And it's a-maze-ing. Plus, it's still a true crock pot meal because everything, including the pasta, cooks in the crock pot over the course of the day. This is a beautiful cheesy pasta with a crust from cooking in the stoneware of the crock pot all day. We loved this. I made it for a casual dinner party with friends and it was a big hit. Plus, you can customize the heck out of this--add diced ham or bacon, maybe tuna, some veggies and play with the cheeses to your heart's content. If you've got a family that loves mac and cheese (or could eat it all by yourself), you'll love this dish. Well, if I'm going to do a week of crock pot meals, you know you're going to get some chili from me. And this chili is a little bit different, full of delicious flavor and, of course, easy to make. The creamy sauce pairs well to cut the heat from the chiles and the chili powder, plus the chicken is a nice change from beef chili. I made this recipe when my Dad came to visit and he liked it so much I sent him home with it so he could make a batch at home. It's perfect for a chili evening or watching some playoff football (not that I particularly care about playoff football this year, sigh, but some people might). Growing up, I used to think it was so fancy to order a Shirley Temple when my parents took us out to eat. We could only get them at "fancy" restaurants and it was so special. And for holiday dinners, my Dad would even make them for us at home. I always got mine with extra cherries (probably why I will still order my Manhattan's with extra cherries today). I remember ordering a Shirley Temple from the open bar at my Godfather's wedding and specifically asking the bartender to make it without alcohol (I was 7, I didn't understand how cocktails worked). So I thought these clever little cupcakes would be a lovely nod to nostalgia and happiness for New Year's Eve. I think they are cuter in miniature and the cherry flavor is light in the cupcake and a little more potent in the frosting, and comes together with a light almond accent. Perfect bite-size treats, with a cherry on top to boot! Did you make pork for dinner last night as a nod for good luck in the New Year? Maybe you roasted up a big beautiful pork loin. Or maybe you went simple and fun and tried the Crock Pot Pulled Pork I posted last week. Either way, I'll bet you have leftovers. And here I am to share a new way to enjoy those leftovers so you don't feel like you're eating that same thing. Shred it and wrap it up in a tortilla with rice, beans, cheese and veggies for a simple but delicious burrito that will have everyone in your house asking for more leftovers. Great flavor, lots of different stuff to make this rival the restaurant burritos. Even Dave said it was on par with some of his favorites from college.